Duncan Lake in Ossipee NH. If you are looking for some piece and quiet this is the lake for you. Sit on your porch or deck and watch the loons and the BEAUTIFUL SUNSETS and not hear the roar of jet skis and motorboats! Top speed on this 114 acre lake is 6 mph. Rare private level Waterfront with great sandy beach. Duncan lake is deep, spring fed and stocked for fishing. There is plenty of room for the entire family. Neat as a pin so you can just move right in. Don't miss out. Upgrades include water, sewer, roof etc. The home has plenty of room for the whole family with 8 rooms, 3 bedrooms and 2 bathrooms on .7 acres of land. Bring the family with your kayaks and enjoy this tranquil lake. Listed by Exit Realty Leaders, L Shure. 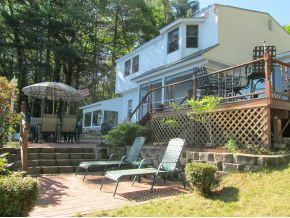 For additional information on this home call Lady of the Lake Realty at 1-888-737-5550 or e-mail at info@nhlakesrealty.comor visit our website to view similar lake homes in New Hampshire at www.nhlakesrealty.com or www.lakeorskirealestate.com.